Ran across the hyper dog ball launcher a couple of years ago, and the potential for re-purposed applications as an antenna launcher for hanging antenna supports seemed obvious. It is not as much fun as a pneumatic launcher, but it sure is easily understood by any boy of 8. No air pump required. Here the body was altered by adding a cheap spin-cast zebco reel picked up for $2 at a yard sale. A spinning reel or open faced casting reel might be better, but I have used the zebco’s since I was 6yo. Being more familiar with the Zebco quirks and limitations is useful. For most, a spinning reel is probably the best option. 10 or 12lb test line has proven the best choice over the years – light enough to fly, strong enough to pull, and not impossible to break if it becomes hopelessly snarled at altitude. The reel is simply attached below the ball carrier with a couple of hose clamps. That was later wrapped with an ugly mess of electrical tape just to reduce the number of exposed sharp edges. Yes, the tennis balls work FB. To modify the tennis balls, they were just drilled with a 9/64 bit. A loop of 1/8th braided nylon cord is secured to a small hardware store drywall toggle bolt/spring bolt. Then just cram the bolt/cord through the hole, reaming the hole out slightly if needed[leaving most of the loop of cord hanging out!]. The base of the cord is sealed at the hole with a goop of liquid nails or hot glue or some-such. The loop of cord is about 6 inches long(~150mm), and the spring bolt serves the same purpose it normally does by providing a large area preventing pull-out. After drying completely – good to go. The tennis balls seem to be a good compromise between weight and a non-destructive & non-threatening projectile. [Just don’t try to pull them back up through the tree-too fast!]. The ‘trick’ to success with it seems to be making sure the cord on the tennis balls clear the end of the slingshot. It seems to work best when the corded end of the ball is facing up(i.e., at the top of the pouch when pulled back for a shot). The only genuine problem I have with it is that it has a “long draw”. Being impishly short my arms are not long enough to get the maximum performance out of the rig. But despite that it works much better than the regular slingshot with fewer snags and mis-fires. 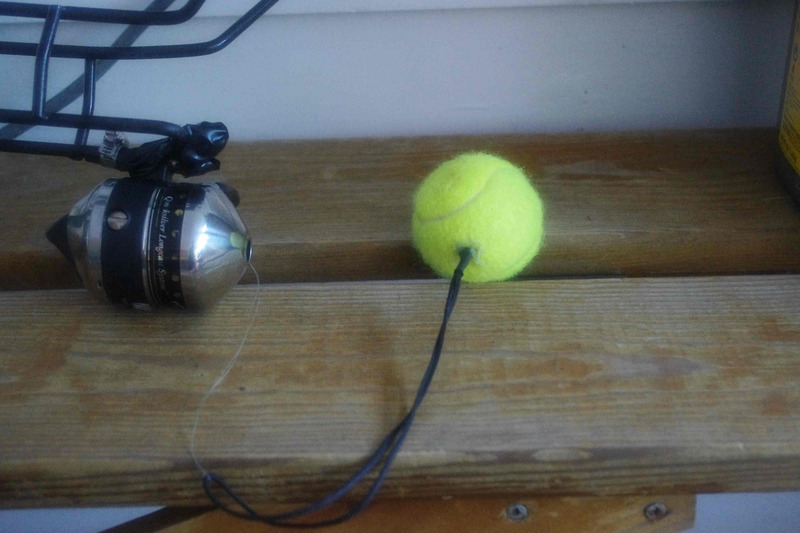 It easily sends the tennis balls up to about 90 feet(~30m). The canopy here prevents anything higher, so no real top-end found yet. There is somebody here on the east coast marketing these re-branded as antenna launchers, and asking $80. See Radiowavz Hyper Hanger, now $90USD…. Good article! When I saw this item at the local Menards store about 6 months ago, my first thought was to use it for an antenna launcher. It was located in the pet section and I paid less than 20 bucks for it. Four tennis balls were included. I have 75 foot oak trees and this nify device shoots over the top of them with ease. Makes hanging wire antennas a breeze! Been a nice improvement to the line stringing arsenal here. 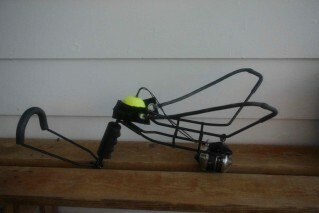 One trick I found with slingshots is to keep the reel away from the slingshot. Don’t mount it out front or below as you will end up pulling a loop of line through the forks of the slingshot. You can have someone else hold it but I figured out something else because I am usually alone. I took a hunk of seat belt webbing long enough to go around the meaty part of my forearm and sewed some velcro on it so I could wrap it and keep it in place. I melted a small slit in the center so I could work the mounting part of a fishing reel through the webbing. Now I can mount the reel near the elbow of my drawing arm. That keeps the reel behind and the line from fouling in the slingsot. Just lower the slingshot after release and keep the draw arm up in the firing position as the line pays out. Works like a charm. Never fouled the line this way. Thanks for the info. I’m going to get one of these dog toys and put my wrist rocket and lead sinkers away! Joe, that is a GREAT tip about placement of the reel. Your solution certainly never occurred to me. Thanks! I can see how keeping the reel above and in line with the shot will help. That has been the biggest problem with using this type of thing as a line launcher. Going to experiment with your idea as soon as the rain goes away, I have some line maintenance that needs work. Kaz – I’m not clear on how to route the loop. 1/8″ braided cord won’t go through the hole in the middle of the spring bolt. And when you say 6″ loop, does that mean circumference (while in a circle form) or end to end if drawn tight into a line? Or something else, as neither seem to be long enough to match the picture. I used a spring bolt because I had them in the spare parts bin. Its just the easiest bit of scrap I had laying about that I thought might work as an anchor. With the right tools it would also be possible to pull a loop all of the way through the ball and make a knot. I don’t know that 1/8 cord is necessary. Any sort of nylon mason’s twine should be sufficient. The important goal is that there is something it is attached to that won’t be pulled out easily, or break too easily. I didn’t have any problem slipping the para cord through the spring bolt, but did a bit of reaming on the hole in the ball to be able to push the anchor bolt through. These have lots of space between the hinges when the wings are compressed. The amount of cord you have hanging out is arbitrary. The loop is about 6 inches long drawn tight. Might be a bit longer, just approximated. It could easily be less loop length and still work. I would expect more problems with it snagging if is too much longer. Not the sort of thing that requires close tolerances or win any beauty prizes. Don’t know if that helps any. Good Luck snagging the right branches. Just got one of the HyperDawgs on Amazon for $14.89 + $5.00 shipping – still a good deal! I’ve got 3 wrist-rocket type slingshots that will soon revert to their original purpose! I was surprised at the HyperDawgs’ size – bigger that the wrist-rockets, for sure! Anyway, I’ll let you know how it works out, but I have no doubt that it will do the job quite well. Been too long since I checked the site for comments. Hope the HyperDawg does the job for you. The leaves are starting their yearly migration to ground level. Clears the lanes for new wires. The Hyperdog sling shot and tennis ball you describe sound like the real deal. In near future I plan to hoist my G5RV higher up than it is presently. As the old hams said in days gone by, “you need to get the fire in the wire and put it up higher”. My compliments on your site Sir.